Keep well watered in Spring and Summer - despite its looks it is not a desert plant. 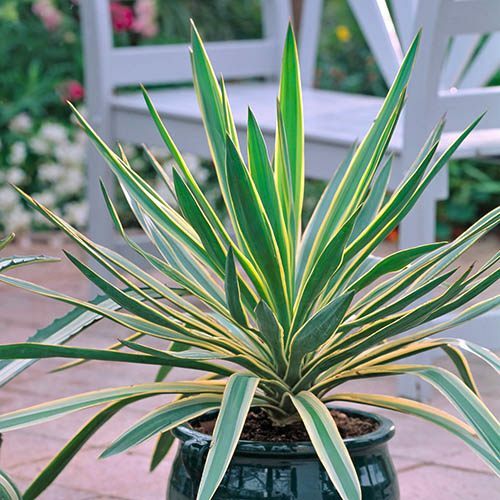 This dramatic plant originally hails from central USA and is fully hardy throughout the UK. It's very long lived eventually forming a strong trunk which is capped by a rosette of sword like fleshy leaves with a handsome creamy margin. It's equally at home in a large pot or sunny border. In summer you'll be rewarded with a spectacular flower spike rearing from the centre of the plant, bearing many creamy white blooms. Remove this as soon as flower fade to allow the plant to regain strength before winter. Desptite it's appearance this is not an a desert plant and likes a moist well drained soil - Yuccas are far easier to grow than many realise, needing little attention once planted and bring instant impact to the garden. Supplied as a 3 year oild plant c 40-50cm tall, very slow growing, ready to plant any time.